The Intel 12Gb/s SAS RAID expander card features 36 ports (28 internal, 8 external) via HD MiniSAS connectors. 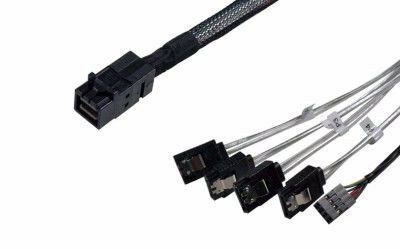 The card draws power from the PCIe slot, but alternatively power can be supplied through a standard 4 pin molex connector. Low profile MD2 form factor. Intel® RAID expander RES3FV28 is ideal for solutions with more than eight drives and is an ideal complement for the SAS-3 generation RAID cards from Intel. Designed with a low-profile, MD2 form factor, the RES3FV288 can be used in any server add-in card slot including a low-profile slot in a 2U rack system. In cases where an add-in slot is not available, the RES3FV288 can even be mounted to a chassis wall or air-duct.